Photochromes are dyes that change their colour depending on the light they receive. When light is switched off they can either remain in their photoinduced state (P-type photochromes) or turn back to their original state (T-type photochromes). T-type photochromes may colour when irradiated, bleaching when light is moved away (direct photochromism) or discolour under irradiation, recovering their colour in the dark (reverse photochromism). During the last decades, both the industrial and the academic sectors have shown growing interest toward organic photochromes for the preparation of colour-tuneable functional materials. Ophthalmic lenses and smart windows are examples of current applications based on direct photochromism. However, functional solid devices based on reverse T-type photochromes are very scarce and have only begun to be reported recently (e.g., in multicoloured light-responsive rewritable devices). Different strategies have been explored to obtain reverse photochromism with organic substances called spiro compounds. Nevertheless, the materials produced so far do not provide flexible tuneability of their photochromic responses. That is, their colour and the speed at which the change is produced cannot be adjusted. Also, chemical reactions are needed to modify the structure of the photochrome so that it produces the required effect. A new, straightforward, reactions-free and universal strategy to obtain solid materials with highly tuneable reverse photochromism has been recently developed from a collaboration between the ICN2 and the Department of Chemistry of the UAB, and published in ACS Applied Materials & Interfaces. The last author of the article and leader of the research is Dr. Claudio Roscini, who supervised the work of the Ph.D. student Àlex Julià, both from the ICN2 Nanostructured Functional Materials Group, led by Dr. Daniel Ruiz. The author from the Chemistry Department of the UAB is Dr. Jordi Hernando. These researchers employed commercially available organic compounds from the family of spiropyran, which can be stabilized to different states with different colours and colouration rates by simply varying the nature of the surrounding media (functional phase-change-material). Moreover, they transferred this behaviour to solid matrices by preparing polymer capsules loaded with spiropyran solutions of functional phase-change-material (which provides the initial colour of the dye) and eventually dispersing them in the final material of interest. 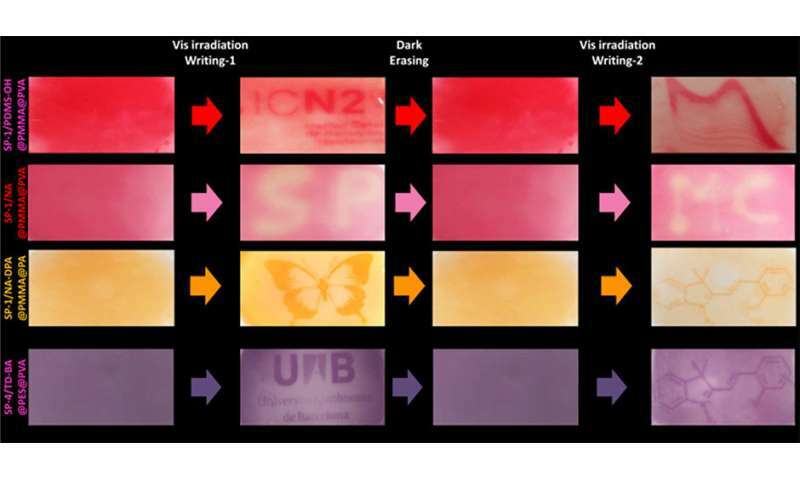 As a result, polymer films with up to three different photochromic responses regarding colours and switching rates could be generated from the same commercial dye. This represents an unprecedented tuneability of the photochromic properties in the solid state. Considering that more colours could be obtained by combining capsules of different types, which might also display other behaviours, such as thermochromism (changing colours with temperature), functional materials could be prepared from spiropyran dyes exhibiting multicolour and multistimuli responses.